A stepper motor can be used in conjuction with PVC rotor blades to make a very cheap DIY wind turbine generator. Stepper motors can be bought new quite cheaply, but they can also be salvaged out of old printers, floppy disk drives, and other sources. Learn more about stepper motors and find out how to identify their wiring reading our articles stepper motor basics, and in particular Examining a Stepper Motor. On the side of most stepper motors is printed the rated voltage and the current per phase. Often an excellent stepper motor will be discarded by the renewable energy enthusiast because the rated voltage is below the voltage required for the application – for example, an excellent 9 Volt rated stepper motor would often be ignored by someone looking to make a wind turbine generator to charge a 12V battery. In some cases a low voltage stepper motor can be used as is since the high speed of rotation of a small wind turbine generator will send the voltage generated high above the rated voltage. However, in time the stepper motor and its bearings will be damaged by being spun much faster than it was designed for. Instead a simple voltage doubler circuit should be considered. A voltage doubler circuit does exactly that – it doubles voltage (minus some losses in the doubler circuit). The power generated by the stepper motor does not change, therefore following Ohm’s Law it can be seen that the output current must be halved if the voltage is to double. Using a voltage doubler enables a useful voltage to be ouput at low rotational speeds with the disadvantage that the current generated at high speeds is lower than it would be without the voltage doubler. Wind speed distributions can be modelled with the Weibull Distribution. This tells us that a wind turbine will experience low and moderate wind speeds far more often than it will experience strong gales. Therefore using a voltage doubler with a low voltage stepper motor wind turbine will result in more charge getting to the batteries on average. Making a voltage doubler for a stepper motor is very simple because stepper motors generate four-phase alternating current (AC) electricity. Therefore all we need is a couple of suitably rated bridge rectifiers wired as per the circuit diagram displayed above. 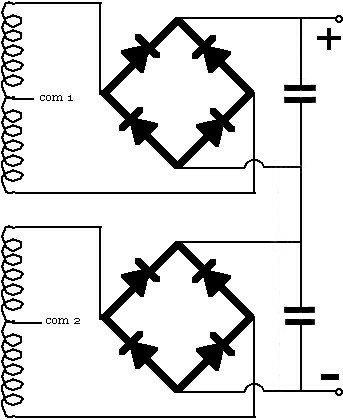 The AC voltage from each of the two pairs of stepper motor coils is rectified by a bridge rectifier into DC voltage and the two output voltages are then added together giving a total output of double the original voltage, but with a current equivalent to that generated by just one pair of coils. nb. Don’t forget that between 1 and 1.4 volts is dropped (i.e. lost) in each bridge rectifier. Build your own bridge recitifier using Schottky or germanium diodes to halve these losses compared to standard silicon based diodes and bridge rectifiers. The two capacitors on the output side are used to give a smooth output DC voltage. If the voltage doubler is for sub-16V applications, then the following 1000uF 16V Capacitors available from the REUK Shop will do the job. Suitably rated capacitors can be used to smooth the output voltage to keep it fairly constant so it can be used directly in electronic applications as well as in battery charging. One capacitor should be placed across the positive and negative outputs of one bridge rectifier, and a second capacitor used similarly across the outputs of the other bridge rectifier. We have more information about smoothing capacitors here. A range of bridge rectifiers is available for sale in the REUK Shop including 1.5 Amp bridge rectifiers which are perfect for use with small stepper motors, and 35 Amp bridge rectifiers which can be used with much larger stepper motors.